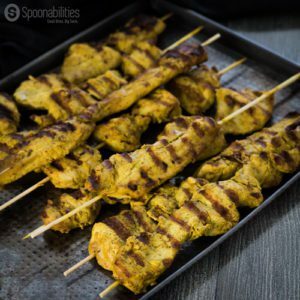 Chicken Satay has been marinated overnight in a mixture of peanut butter, lemongrass paste, soy sauce, Pure Cottonseed Oil, Fresh Cilantro Oil by Acala Farms, and other spices. Skewered and grilled for a quick and easy weeknight dinner. Serve as an appetizer with spicy peanut sauce for dipping. 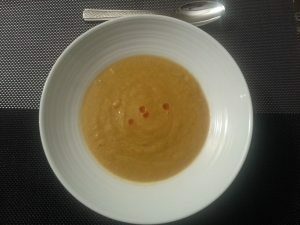 This recipe is super easy to make and fun to eat. 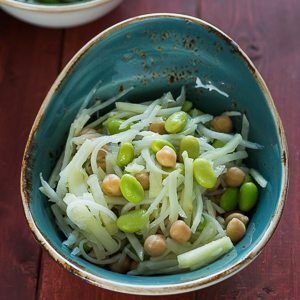 Kohlrabi Salad with Edamame, Chickpeas, and Cilantro Cottonseed Dressing recipe. It’s a very simple, refreshing and crunchy salad and accentuated by a light dressing made with Cilantro Cottonseed oil, apple vinegar, and lemon. The dressing gives this salad another dimension of fresh and unique flavors. In a large pot on medium to high heat, pour in the Cilantro Cottonseed Oil. Add the vegetables and salt & Pepper to taste. Then cook the vegetables for approximately 7 minutes.